Cardiff City's turbulent season: Where did it all go wrong? "Goodbye Manish, Hello Gary" read the banner as Cardiff City's fans celebrated finally reaching the Premier League. A year on, the Bluebirds are waving farewell to BBC Match of the Day presenter Gary Lineker to once again have their team's action brought to them on a Saturday night by Manish Bhasin on the Football League show. Few of the supporters who partied on the pitch after the 0-0 draw with Charlton in April 2013 could have predicted the turbulent times that lay ahead - nor that their stay in the top-flight after a 50-year absence would be so brief or turn so sour. As relegation was confirmed after their 3-0 defeat by Newcastle, the question is simple: Where did it go wrong? Cardiff spent heavily in pre-season, twice breaking their transfer record as Dane Andreas Cornelius came in for £7.5m, followed by Chilean hardman Gary Medel for £11m. Tottenham defender Steven Caulker was also a £9m buy as the Bluebirds made seven signings. Those signings turned out to be the cause of off-field controversy which would dominate their season. Before that, in their first home game, Cardiff announced their arrival in the big league with a sensational 3-2 win against Manchester City. For supporters, it was a moment that made all the cold nights at Scunthorpe, Rochdale and Colchester worthwhile. However, it was a rare highlight in a troubled campaign. 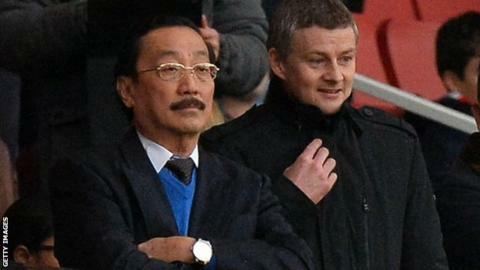 Owner Vincent Tan had split opinion with his decision to rebrand the club's colours from blue to red in the summer of 2012. However he had kept a low profile during their run to promotion and the Championship title. He would barely be out of the headlines over the ensuing months. First, head of recruitment Iain Moody was sacked for an alleged overspend of £15m on transfers in the summer - something manager Malky Mackay denied. Reports then emerged before October's defeat at Chelsea claiming that Tan had tried to influence first-team tactics during matches. Mackay dismissed the story, but some were questioning whether the Scotsman's position was becoming increasingly untenable. Despite the off-field distractions, Mackay continued to pick up the results needed to keep Cardiff out of the bottom three. They beat Swansea in the first-ever Premier League south Wales derby in November, and then fellow strugglers West Brom a month later. But, just before Christmas, it emerged that Tan had sent Mackay an email with the ultimatum: "resign or be sacked". The Malaysian businessman was not happy with a combination of results, style of play, and a perceived failure of the summer signings. Mackay survived the defeat at Liverpool, in which he was unanimously backed by the travelling fans. The final straw for Tan was the home thrashing by Southampton on Boxing Day, and Mackay was gone. They were 16th in the table, one point above the relegation places and four clear of bottom-placed Sunderland. Former Manchester United striker Ole Gunnar Solskjaer was appointed as the new manager and his reign started with an FA Cup third-round win at Newcastle. He was also backed by Tan in the January transfer window as seven new players arrived, including Fabio and Wilfried Zaha from former club United. Results did not improve though. Cardiff won just one of Solskjaer's first eight league games, dropping into the relegation zone after a home defeat by West Ham on 11 January. They would not get above 17th for the rest of the season. Big games came and went with heavy defeats: 3-0 at Swansea in February; 4-0 at home by Hull; and 3-0 at home by Crystal Palace. Less than a week after Palace's win, it emerged Cardiff had complained to the Premier League, alleging that their team selection had been leaked in advance to Moody, now the sporting director of Crystal Palace. The Eagles have denied the claim. In a letter sent to the league by Cardiff, the Bluebirds stated they wanted the result not to stand, though Solskjaer himself denied he had asked for this. The controversy initially seemed to galvanise the squad as they upset the odds to win 1-0 at Southampton and raise hopes of a "miracle" escape from trouble. Cardiff's 'six-pointer' at Sunderland in late April was a crucial point, with a damaging 4-0 loss. What many fans had feared for months and others had become resigned to, was confirmed with the in their penultimate game of the season. And after just one season, Cardiff were once again a Championship club. Some claim they could have survived had Mackay had stayed. Others believe his signings did turn out to be poor business - Cornelius returned to Denmark in January having failed to score in Cardiff colours - and that Solskjaer was in an impossible position. The Norwegian, though, remains committed to the challenge of bringing the club back up next season. However, the season that Cardiff fans had longed for was marred for many by the background noise. The dream, became a nightmare. Goodbye Gary, hello Manish.